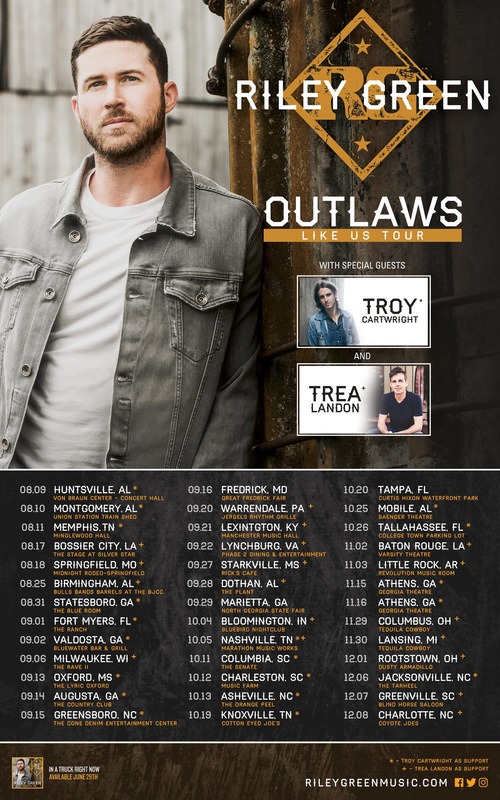 Riley Green has announced he will kick off his Outlaws Like Us Tour in his home state of Alabama on Aug. 9 before hitting 38 cities through December with openers Troy Cartwright and Trea Landon. The tour will visit Memphis, Tennessee; Milwaukee, Wisconsin; Lexington, Kentucky; Charleston, S.C., Bloomington, Indiana; Lansing, Michigan; and more, including a Nashville show at Marathon Music Works on Oct. 5. Tickets will go on sale Friday, June 22 with more shows announced in the coming months. Raised on the sounds of traditional country, bluegrass, and southern gospel, Green’s music has already racked up over 27 million streams to date.